This Hawke 3-9x40 Vantage IR Riflescope and Medium Match Ring Mount Kit was put together by B&H to remove the unnecessary guesswork, save time, and give you a complete combo that is ready for use immediately after unboxing. The included Vantage riflescope is designed to exceed your expectations in terms of performance while also providing simplicity of use and handling. It is a durable, waterproof, and fogproof precision optic that will work seamlessly with the pair of included medium Weaver rings. Designed as a multi-purpose, utilitarian mid to long-range optic, the Hawke Optics 3-9x40 Vantage IR Riflescope boasts a partially-illuminated crosshair reticle with five selectable brightness levels for use in most lighting conditions in either red or green. Red is ideal for low-light conditions, while green is easier to see in bright sunlight. The 40mm objective draws in generous amounts of light versus smaller objectives while maintaining a low-profile. Covered turrets help guard against accidental adjustments while a fast-focus collar and knurled rheostat allow you to quickly adapt to rapidly changing situations. 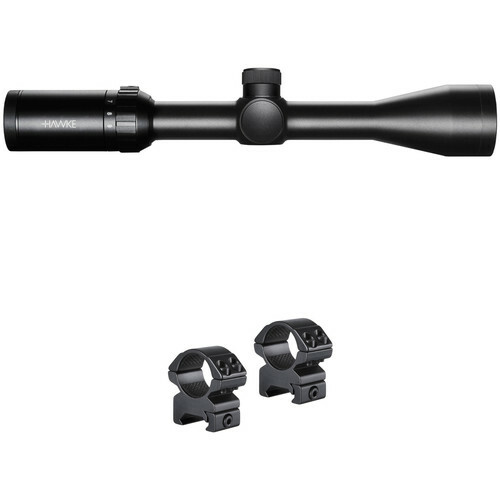 Complementing the performance of the scope is a lightweight and durable anodized aluminum housing, with a 1" one-piece maintube that is nitrogen-filled and O-ring sealed to be water and fogproof. Designed to attach riflescopes with a 1" maintube to a Weaver mounting system, this Match Mount from Hawke Sport Optics features a two-piece anodized aluminum alloy design along with a medium profile that positions the center of the scope 1.1" above the mount. The scope is secured in place with double hex screws and internal cushion tape prevents marking or damage to the scope's exterior. A crossbar is also integrated into the design for additional mounting security during use. Box Dimensions (LxWxH) 14.6 x 3.9 x 3.0"
Box Dimensions (LxWxH) 6.3 x 4.85 x 1.05"